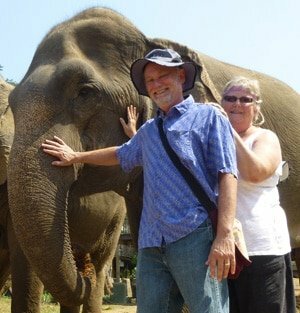 During our two weeks in Chiang Mai it was suggested that we must not miss the Chiang Rai area. So we hired Mr. Dee, a driver recommended by our host family, and headed out for a full day of touring that he planned for us. Mr Dee was a charming man with pretty good English. He shared jokes and stories with us along the way and taught us to say Hello in Thai. We left early in the morning, in Mr Dees air conditioned Toyota. From the city of Chiang Mai, Thailand it is at least a two and one-half hour car drive to the northern city of Chiang Rai. 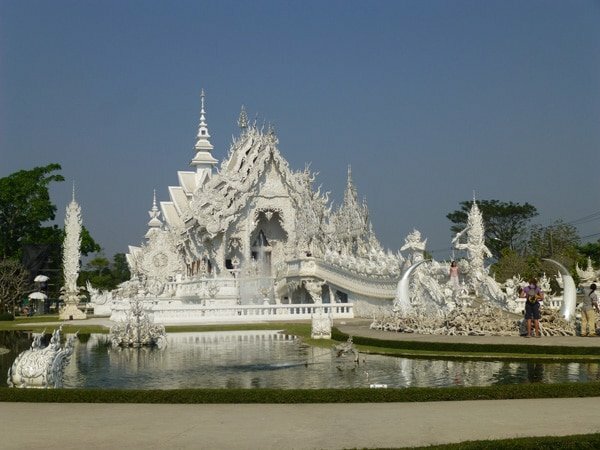 Like most folks who visit Northern Thailand, we traveled to see the famous Wat Rong Khun, known as the White Temple, and the area known as the Golden Triangle. At the junction of the borders of Thailand, Laos and Myanmar, the Golden Triangle is renowned as the heart of the opium trade in Southeast Asia. 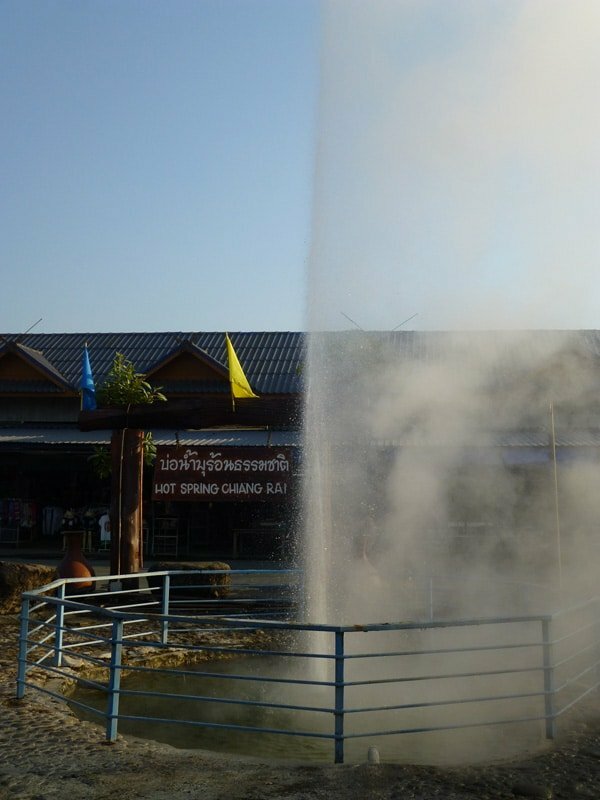 The first stop on our trip was the Hot Springs at Chiang Rai. The hot springs themselves are not that interesting, but the water is quite hot and you can soak your feet. We also saw some school children on a field trip, cooking eggs using woven baskets on long handles, dipping them in the hot water. 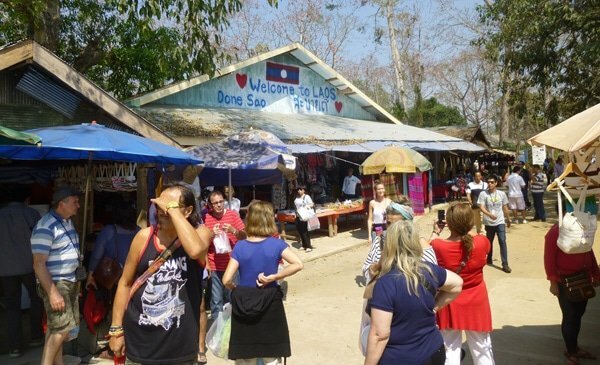 Occupying the majority of the site are open air shops that sell the usual selection of Thai souvenirs. This was a good place to stop for breakfast because there are plenty of food stalls. Our guide had some breakfast while we dipped our feet and looked around. After a little more travel time, we had our first view of the White Temple, the creation of Chalermchai Kositpipat. The pictures really do not do it justice. It is a breathtaking sight shining in the sunlight, like a jewel, due to the millions of tiny mirrors that adorn every surface. It is also built on so grand a scale that it overwhelms the senses. The artist used white and silvery mirrors because he believes that the more commonly used gold represents greed and is not in line with his vision. 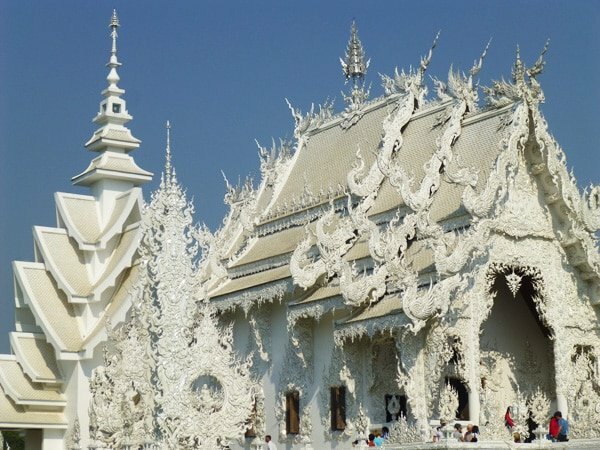 The detail and intricate carving on every surface of the White Temple are truly mind boggling. The murals inside were being painted as we visited. There is a large team of painters working on the murals and the designer expects it to be completed long after his own death! After spending an hour enjoying the splendor of the White Temple, we visited the museum next door. On display are dozens of paintings and sculptures, including tiny carved jewelry, that are the work of the artist, Chalermchai Kositpipat, architect and designer of Wat Rung Khon. The next part of our trip took us to our lunch stop, a restaurant called the Golden View, on the shores of the Mekong River. They featured traditional Thai cuisine and specialized in seafood dishes. 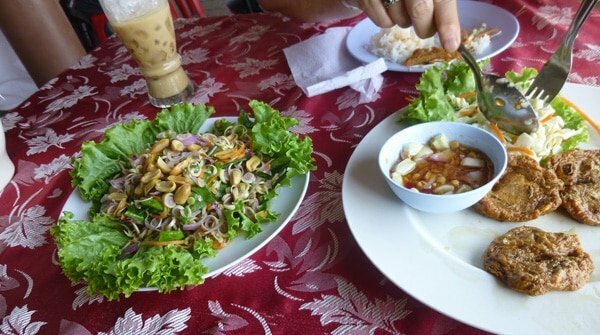 We had some fish cakes and a salad, which were tasty as well as a challenge to our tongues due to the presence of chillies in the dishes. We learned to always order our food “Mai Pet” (not spicy) but dishes are still sometimes too spicy for our taste, even though Neil has always been someone who could eat spicy food in the US. After lunch, our guide, suggested a longboat ride on the Mekong River and told us that we would be visiting Laos, which was frankly a surprise. 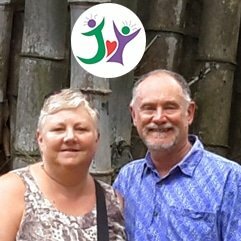 Once we boarded the boat, it moved right along, but instead of heading toward Laos, we headed toward China. We learned that we could be in China in about five hours. Mr. Dee, our guide, was quite the joker and thought it funny to ask if we wanted to take a side trip to China. Laurie found the boat ride to be a bit bumpy, and we had not prepared for getting wet, but we dried quickly in the hot sun. 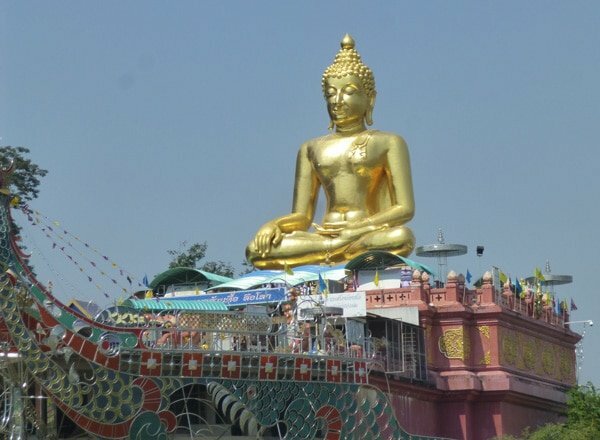 Along the way, we passed some riverside casinos and this huge golden Buddha statue, shining in the sun, which sits above a casino! Mr Dee said that he thought it was built to give tourists something to look at when they came to the Golden Triangle! There was not much to see here and the landscape was dry and unimpressive. The ride to Laos in the other direction was quite short and we quickly disembarked to our surprise destination, an open air market. We were actually on an island off the shore of Laos. We did not need our passports, but did have to pay about 3 dollars each to visit! More time to buy souvenirs, this time in Laos. Here is what it looked like on Done Sao, Laos. 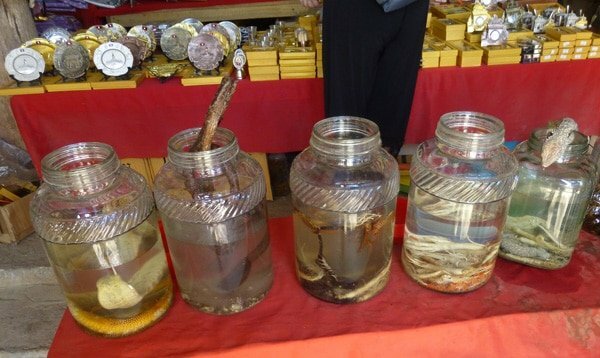 Another attraction at this tourist stop was the snake booze booth, where you could purchase a shot of alcohol in which a venomous reptile had been pickled. This is reputed to make one strong. We passed up this chance. 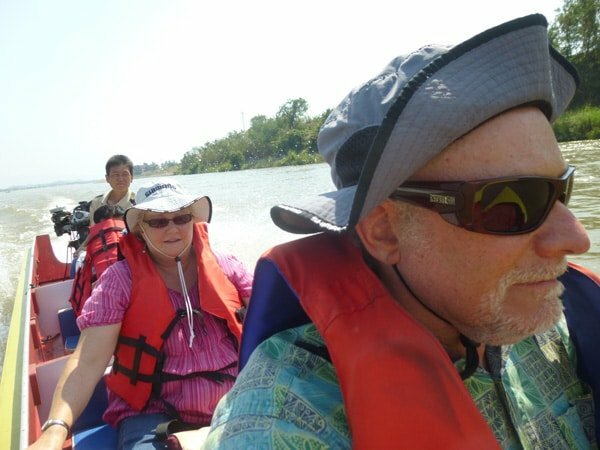 Shortly thereafter, we were back on the longboat for our ride back to Thailand and our final stop in the Golden Triangle, the Opium Museum.This whole boat trip felt like a plan on behalf of tour guides to make the trip seem like a fuller day. 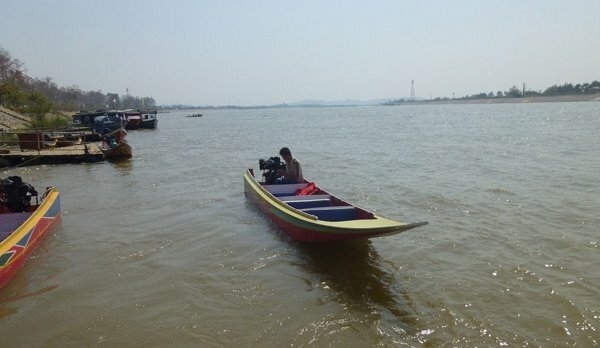 We also had to pay extra for the boat ride to the Lao shops which we were not wanting to visit. Still, we were entertained and just let it unfold. 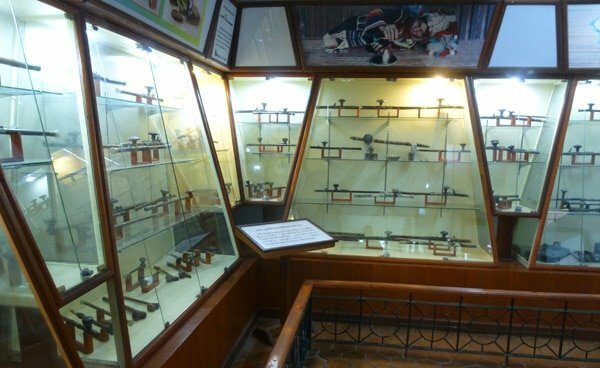 The museum had a lot of exhibits that chronicled the rise of the opium trade. We saw old style pipes, bongs and scales. The weights for the scales were in the shapes of animals from the zodiac system used in the area. They were made of precious metals at first, bronze more recently. 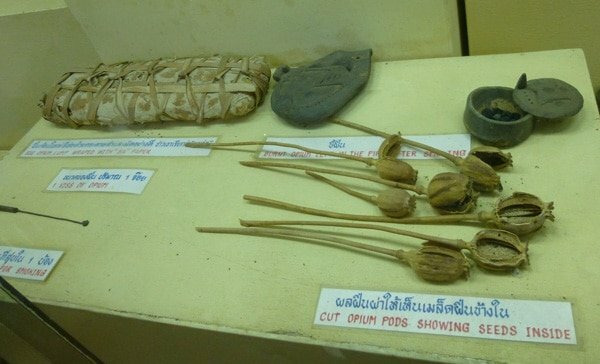 The museum was very informative about growing and harvesting opium. Then there were some admonishments about the addictive nature of the products, including models of wasted looking opium smokers. We learned that the pillows they used were very hard ceramic or wood, but shortly felt as soft as a cloud to the smokers! Both of us thought the visit to the temple was well worth the trip and were glad we asked for extra time to visit the museum and see the paintings by such a gifted artist as Chalermtchai Kositpipat.